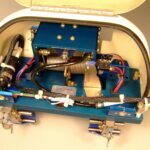 Camera Installations For Aerial Photography | Fliegen Works Inc.
Summary: Design, prototype and production of camera mount and lowering system for Immersive camera. Client Request: To design and build a system that would lower Immersive Media’s camera below an array of helicopters. 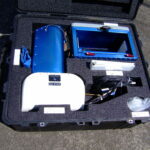 The camera must have a 360 degree clear view, and be able to lower and raise out of harms way on landing. Results: Fliegen Works has prototyped and designed a camera lowering system that can attach to most helicopter landing skids. It is simple to install, failsafe, and provides a stable platform for the camera to have a full 360 degree view when lowered. Fliegen Works has completed certification after successful structural and flight tests. 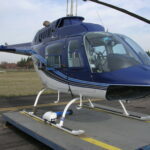 FAA Approvals: STC approved for the Installation on the Bell 206, and the R44, PMA approval for manufacturing.